The 240 mm Howitzer M1, popularly nicknamed the "Black Dragon", was a towed howitzer used by the United States Army. The 240 mm M1 was designed to replace the World War I era 240 mm Howitzer M1918 which was based on a 1911 French design and was outdated by World War II. The project to replace the M1918 began in 1941. The 240 mm howitzer was the most powerful weapon deployed by US field artillery units during World War II, able to fire a 360 lb (160 kg) high explosive projectile 25,225 yards (23 km). It was the largest field piece used by the US Army during the war except for naval ordnance adapted into railway guns. The weapon addressed the requirement for super heavy field artillery capable of attacking heavily reinforced targets like those likely to be found along the Siegfried Line. The 240 mm howitzer M1 was designed together with the longer ranged 8-inch Gun M1, and they both shared a related carriage. While use of the 8-inch gun was limited due to excessive bore wear and poor accuracy, the howitzer saw considerable action during World War II in Europe due to its effectiveness against difficult targets such as heavy concrete fortifications. It was also used in the Pacific campaign, notably in the Battle of Manila, but few targets there were heavily fortified enough to justify its use. 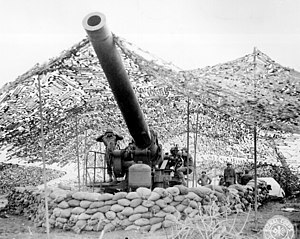 The US Army retained the 240 mm howitzer after World War II, and later deployed it in the Korean War. The howitzer remained in US service until ammunition stocks were exhausted in the late 1950s. The 240 mm howitzer M1 is still in service with the Taiwan's Republic of China Army, stationed in hardened bunkers of the frontline Kinmen and Matsu Islands. The first operational use of the super heavy 240 mm Howitzer was by the U.S. 5th Army at the Anzio Beachhead in Italy in January 1944. Along with the 8-inch (203 mm) gun (which was deployed at Anzio from April 1944) – super heavy artillery was used as counter-battery fire against German guns in their class. Their fire was accurate enough not only to knock enemy artillery out of action, but also to destroy targets as small as German heavy tanks. US super heavy artillery also played a role in countering the infamous Anzio Annie railway gun and putting it out of action. In Italy, the 240 mm Howitzer was highly valued for its capability to destroy key bridges at long range. Army Ordnance officers credited the "devastating fire power and incredible accuracy" of the 240mm howitzer in playing a decisive role in the Italian Campaign. During the Battle of Monte Cassino, the weapon was used in the final destruction of the monastery at Monte Cassino already damaged by air attacks. In the Italian theater, a small number of the 240 mm howitzers also saw action in the service of the British Eighth Army. Despite their initial misgivings over the deployment of such a heavy and unwieldy weapon, 5th Army commanders dubbed the 240 mm Howitzer as, "the most generally satisfactory weapon" in service in 1944. The 240 mm howitzer also saw extensive service in the Western Front reducing reinforced targets requiring super heavy artillery. During the Korean war, twelve 240 mm howitzers were brought out of 'mothballs' and sent to the front lines to deal with deep bunkers and fortifications built by the Chinese that could not be effectively attacked by the smaller artillery weapons then on hand. They were utilized in two units in Korea, the 213th and 159th Field Artillery Battalions. The weapons went into action on May 1, 1953. On that day, the first round was fired by Baker battery 213th at a target on top of a hill called ‘the donut’ by aerial observers. The first round was just supposed to be a ceremonial shot, however it struck an ammo dump directly on top of ‘the donut’ which set off a chain reaction and blew part of the top of the hill off in a spectacular fashion. In the late 50s, several M1s were transferred to the Republic of China and stationed in the front line Kinmen and Matsu Islands. The guns were put on rails to enable the howitzers to deploy outside for fire missions and to retreat inside their hardened bunkers/tunnels for protection (capable of withstanding direct hits from aerial bombs) when needed. Due to the problems with moving such a large heavy weapon, a self-propelled version was made by mounting it on a stretched Heavy Tank T26E3 chassis that had an extra bogie wheel per side as the T92 Howitzer Motor Carriage, but the war ended before it could be used and was later scrapped. ^ a b "'Black Dragon' Italian Success", T-Patch 36th Infantry Division News, Army times., Retrieved on 2007-05-25. ^ a b Zaloga, Delf – US Field Artillery of World War II, p 34. ^ a b c "M1 240 mm Howitzer", Globalsecurity.org, Retrieved on 2007-05-25. ^ a b c d e Schreier – Standard guide to U.S. World War II Tanks & Artillery, p 105. ^ a b c d Zaloga, Delf – US Field Artillery of World War II, p 33. ^ Sobiesky, Tony., "240 mm Howitzer: Kiss Of Death", the KOREAN WAR, Updated on 2014-11-22. ^ M1 240mm Howitzer "Taiwan M1 240mm Howitzer" Archived 2011-05-01 at the Wayback Machine, Retrieved on 2010-02-20. ^ "Kinmen M1 240mm Howitzer firing exercise", Retrieved on 2010-03-06. ^ "United States' T92 Howitzer Motor Carriage", wwiivehicles.com. While 115 were planned, only five were built. Retrieved on 2010-02-28. Hogg, Ian V. (1998). Allied Artillery of World War Two. Greenhill Books. ISBN 1-85367-478-8. Zaloga, Steven J., Brian Delf – US Field Artillery of World War II (2007) Osprey Publishing (New Vanguard 131), ISBN 978-1-84603-061-1. Schreier Jr., Konrad F. – Standard guide to U.S. World War II Tanks & Artillery (1994) Krause Publications, ISBN 0-87341-297-4. Wikimedia Commons has media related to 240 mm howitzer M1. "M1 240 mm Howitzer", Globalsecurity.org, Retrieved on 2007-05-25. This page was last edited on 21 October 2018, at 08:08 (UTC).